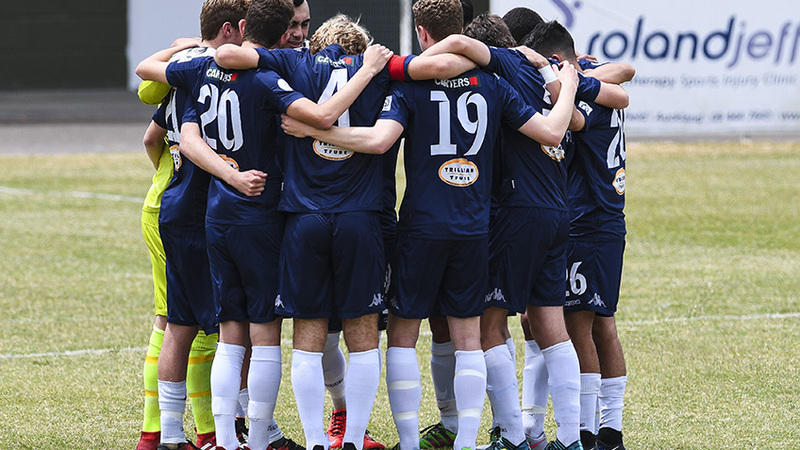 AUCKLAND, New Zealand - Camilo Speranza's Junior Navy Blues stay top of the table after a third win in a row, this time a 1-0 win over Hawke's Bay United. Oscar Spragg had the first real chance of the game when he blazed a shot over the Bay crossbar after ten minutes in a match played in wet and windy conditions in West Auckland. The match was goalless at the break after the Junior Navy Blues dominated possession but it was the visitors who nearly scored next when Cameron Brown palmed a decent effort away from a Hawke's Bay corner. The match looked headed for a draw when midway through the second half Dhanush Chandra broke the deadlock to hand the home side a deserved advantage. Coach Esperanza made his first substitution shortly after and in the transition Bay nearly equalised only for Brown to come to the Junior Navy Blues rescue with another top save. "I'm very pleased because of how the team played today. We were talking to the boys in the dressing room after the match that like the first game with Waitakere United we didn't deserve to score five, today I felt we deserved to score at least a couple of more goals. "I'm very proud of the way they behaved - they were brave and courageous and moved the ball and their opponents around. I'm very happy not only with he result but the way they played. "We dominated the whole match except for 10-15 minutes in the first half. We were strong and overcame that situation. "Every player did a great job. Our centre backs were brave and stepped into their opponents' half and midfield did an awesome job. Everyone got touches on the ball. it was a huge collective effort. "We're looking forward to Eastern Suburbs but we're not preparing anything special. Every game is of equal importance to what we are trying to achieve and where we want to go," Speranza told www.aucklandcityfc.com. Elsewhere, Tasman United and Team Wellington drew 2-2 while Hamilton Wanderers went down 3-1 at home to Southern United. On Sunday, Canterbury United meet Eastern Suburbs at English Park at 11am and Wellington Phoenix entertain Waitakere United at Fraser Park at 2pm to complete the weekend's National Youth League action.